This dressing can easily be poured on to steamed or boiled vegetables, added to your mashed potato or used to coat a piece of poached or grilled chicken/fish straight out of the oven. Crush the garlic and set aside for 5 minutes to enhance their health boosting properties. Place the oils, lemon juice and mustard and garlic in a jar. Add a little salt and pepper to taste. Shake well and pour a tablespoon on to your favourite foods. This dressing will last up to a week in the fridge. We’ve added Vitamin C and antioxidant rich lemons and antibacterial garlic to our hot dressing to boost your immune system. You can boost this hot dressing even further with some antioxidant rich dried herbs such as basil, oregano, rosemary or thyme. 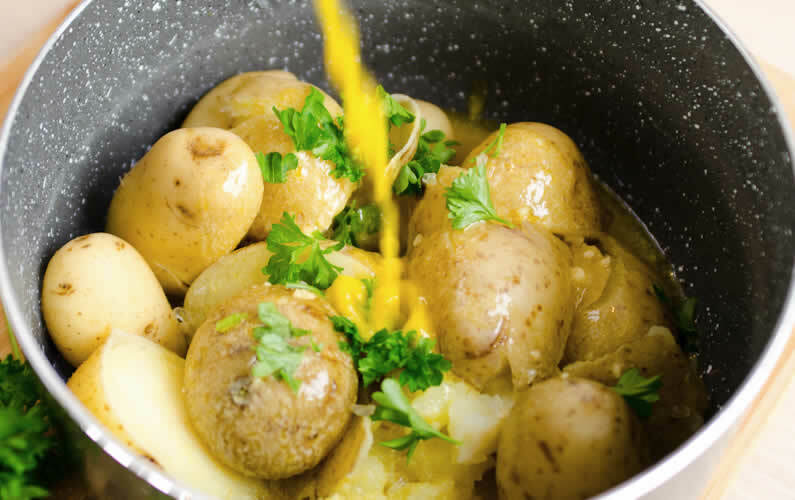 See Video Above Demonstrating this recipe and featuring Newgrange Gold on RTE Nationwide Programme.